Charlie Schneider often does site specific work and this mural is no different. It was made with the concept that the tunnel was already used as a bicycle commuter tunnel. 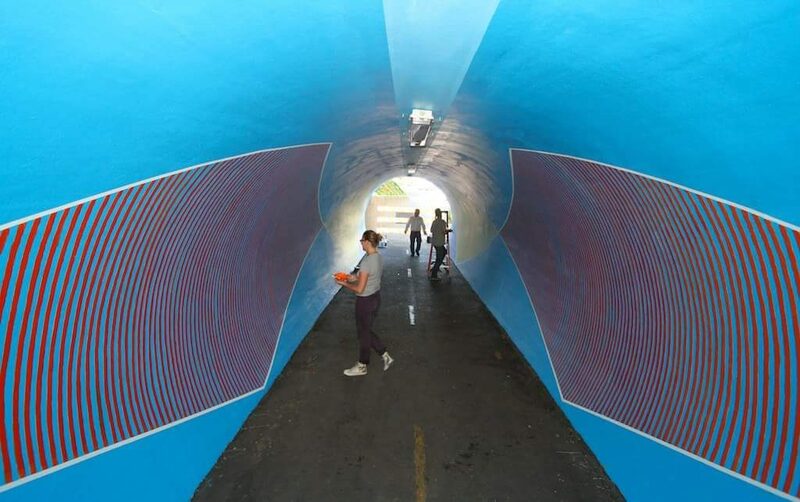 His concept for the mural was to allow the speed of the bicyclists to distort the view of the mural, therefor the colors and shapes would blend together creating something entirely different. The mural also has a soundwave aspect to it, as you ride by and turn your head to view it the sounds are distorted as well. Tunnels are about transformation in a lot of ways and blending in the process.